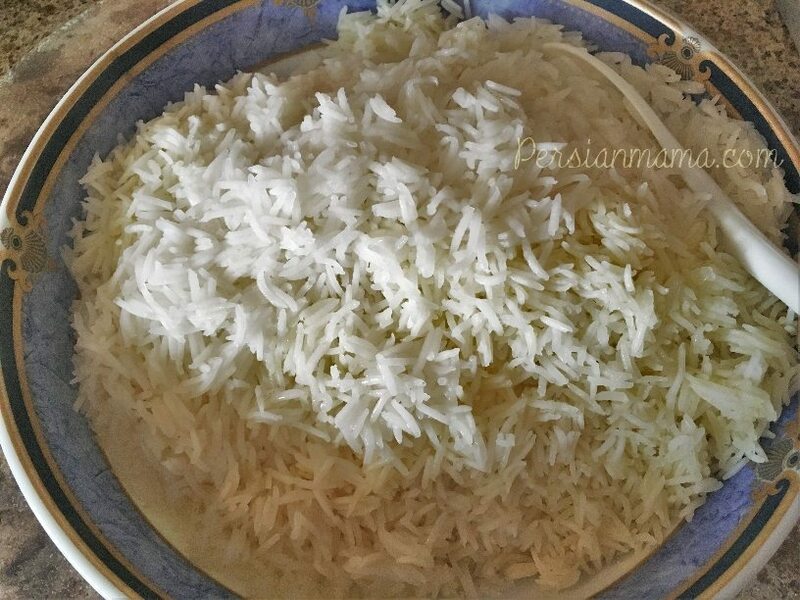 Kateh is the Persian quick rice that is very popular in Iran. 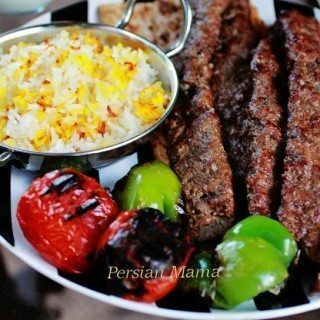 Kateh does not need the preparation that the steamed Persian rice requires. There is no need to par boil the rice before the steaming stage. The amount of water used in the recipe cooks the rice to perfect tenderness, and then it is steamed. 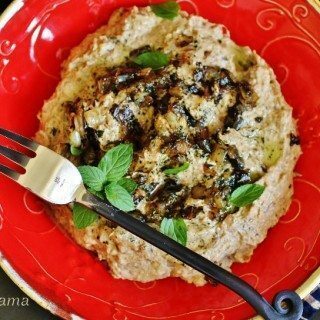 Kateh may be cooked in a nonstick pot (like this recipe) on stove top, or in a rice cooker. 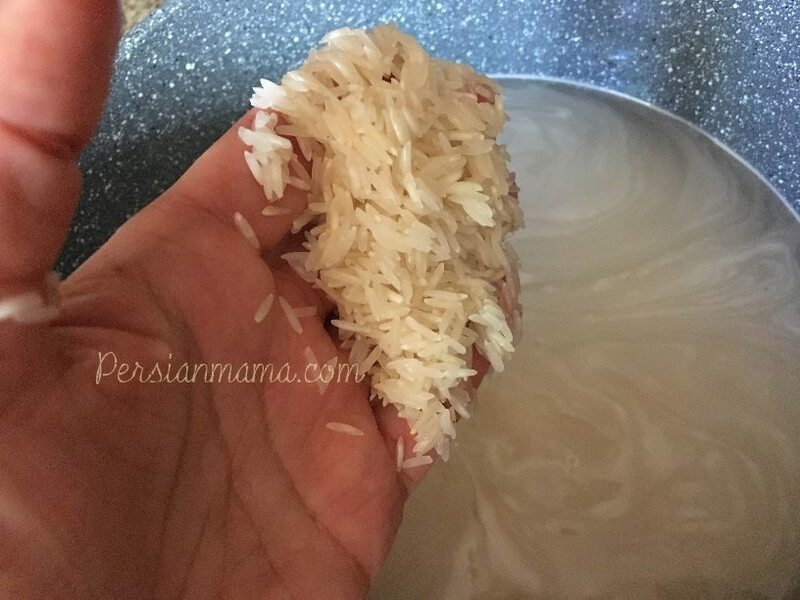 A good formula to remember when making Kateh is to keep the rice to water ratio 1 to 1 plus an extra 1 1/2 cups of water. For example for 3 cups of rice you will need 4 1/2 cups of water and for 4 cups of rice you will need 5 1/2 cups of water. Three cups of basmati rice is added to a 4-Qt nonstick pot, and it is washed 2-3 times in cold water. The water is drained every time and fresh water is added to the pot. After the third wash, drain as much of the water as possible. Then add 4 1/2 cups of cold water, 1 1/2 teaspoons of kosher salt and 4 tablespoons of ghee or clarified butter to the pot. 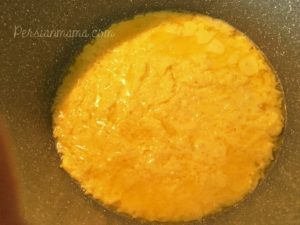 I have posted how to make ghee before, and to make clarified butter you will need to melt the butter and bring it to a low boil, then use only the clear butter fat on top and discard the water and milk solids at the bottom. All together you will need 8 tablespoons of butter fat for this recipe. Melt 1 cup of butter, skim the fat, use what you need and save the rest for another use. Bring the water to a boil over medium heat, then reduce the heat to the marking between low and medium low and cook covered for about 10 minutes, or until all the water is cooked off. A point worth mentioning is that the original Kateh is made in one pot from start to finish without saffron TahDig. 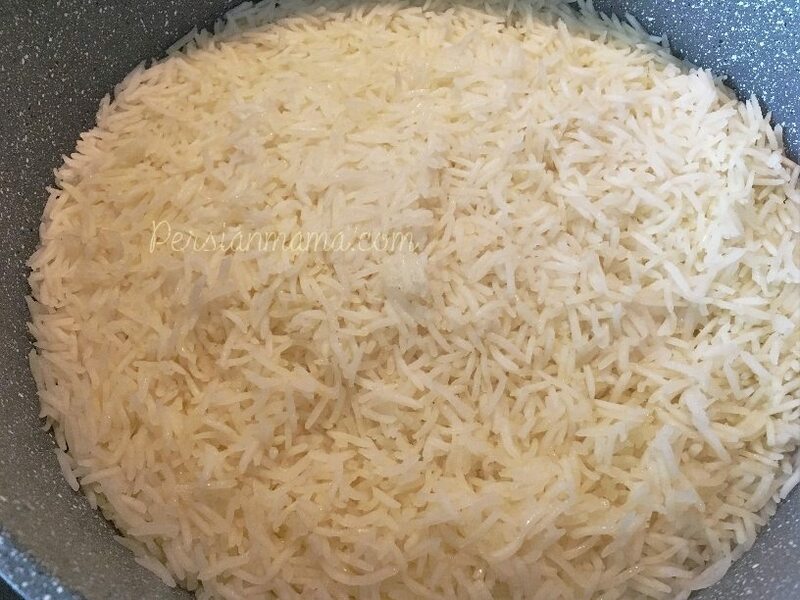 In that case after all the water is cooked off the rice is left in the pot and 4 tablespoons of melted ghee is drizzled on the rice, including the sides. However, I like to make this TahDig from time to time. Transfer all the rice into a bowl and start making the saffron TahDig. 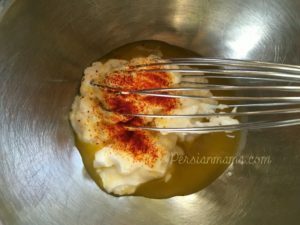 Whisk together one egg yolk, 1/3 cup yogurt and pinch of saffron in a medium bowl. Fold in 1 cup of the cooked rice into the yogurt mix. Heat 4 tablespoons ghee and 2 tablespoons of vegetable oil in the pot. Add the rice and yogurt mixture to the pot and spread evenly with a spoon to cover the entire bottom. Use a spatula to add the remaining rice to the pot. Smooth the top with the back of your spoon and pat it down a little bit, this will make the sides stick together when you will be inverting the Kateh, for a nice presentation with the TahDig on top. Cover the lid with a damkesh or a large kitchen towel and steam the Kateh over medium low heat for 45 minutes to 1 hour. Use a fork to gently push the side of the Kateh at the base and check the color of TahDig. You may also invert the Kateh on the serving platter and if the TahDig is not dark enough put the pot back on top of the Kateh and re-invert it back into the pot and steam it for another 7-10 minutes. 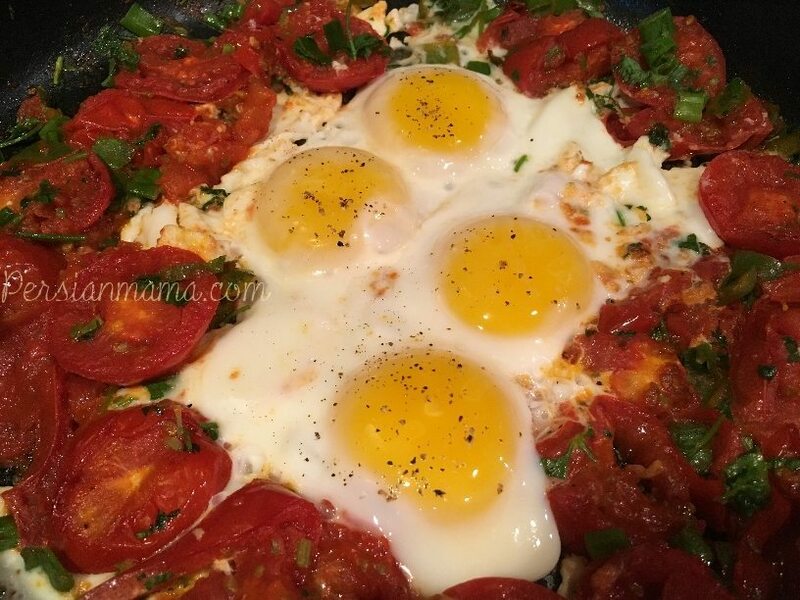 A favorite side for Kateh is this delicious egg dish called “omellete,” which is a rustic dish made with tomatoes and fried eggs. I’ve added a scant amount of diced fresh jalapeno peppers and chopped fresh herbs to my omellete for a nice heat and flavor! Kateh may also be served with most khoresh reicpes, such as Khoresh Gheymey, or Khoresh Ghormeh Sabzi; it also pairs very nicely with Tas Kabob stew and Baghali Ghatogh. Invert the Kateh by placing a large platter on top of the pot; hold the platter and the pot handles and invert the rice, to have the golden TahDig displayed on top. 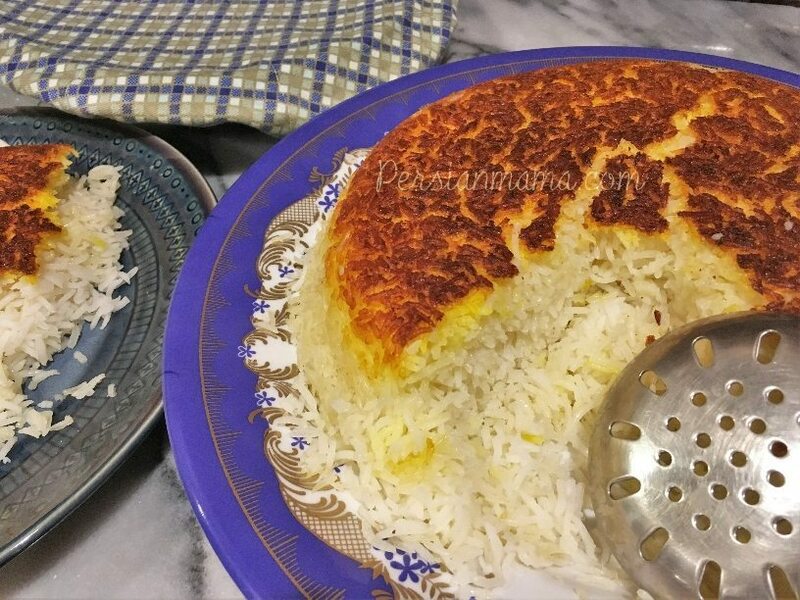 A nice feature of this buttery Kateh is that the rice turns out fluffy and more tender than the regular Persian rice, laced with delicious butter. 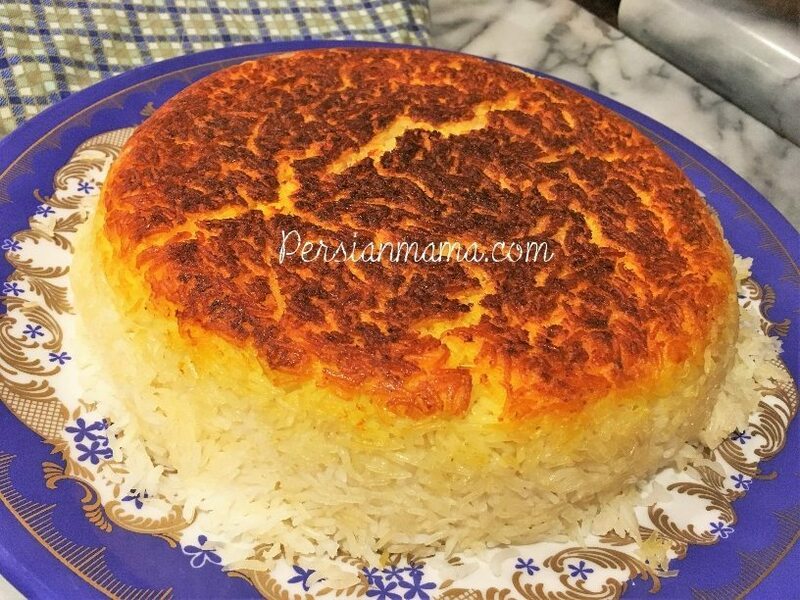 The rice and butter aroma is all so very tempting, and you know how delicious it’s going to be when you walk into any house that has this Kateh steaming on the stove. 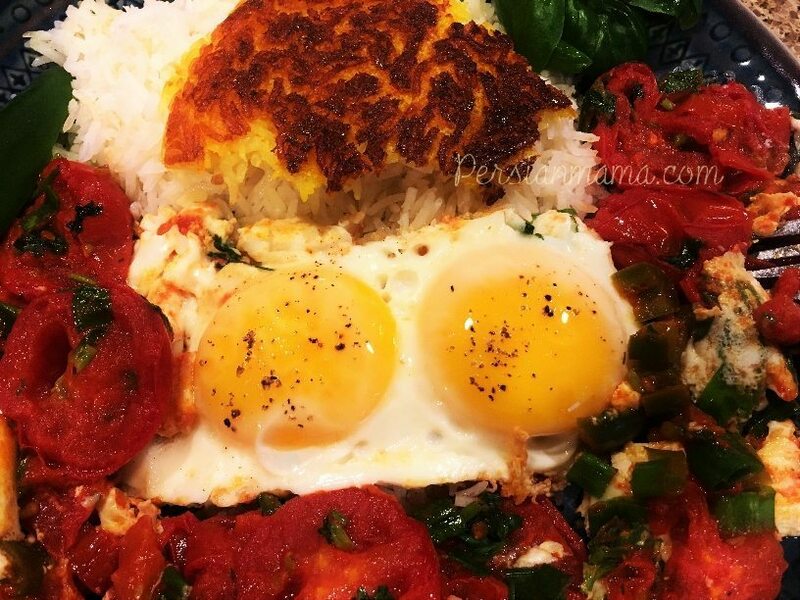 Serve a wedge of the Kateh with TahDig and a side of 1-2 eggs with tomatoes per person and enjoy this simple and traditional Persian favorite! Add 3 cups of basmati rice to a nonstick 4-Qt pot. Wash the rice with cold water, drain and repeat 2 more times. Drain as much of the water as possible. Add 4½ cups of cold water, 1½ teaspoons kosher salt, and 4 tablespoons ghee or clarified butter. Cover the pot and bring it to a boil over medium heat. Reduce the heat to medium low and continue cooking for about 10 minutes, or until all of the water has been cooked off. Remove from the heat. Transfer the par cooked rice to a shallow container and set aside. You will use the same pot to steam the Kateh. 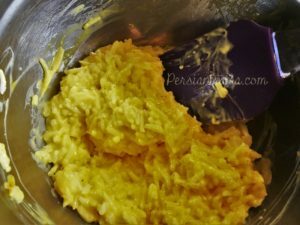 Now make the saffron tahdig: Add one egg yolk, ⅓ cup yogurt and pinch of saffron to a medium bowl. Whisk gently until combined. 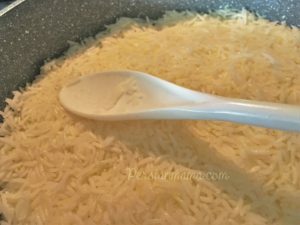 Use a large spoon to fold in 1 cup of the par cooked rice that is in the shallow container. In the same pot heat 4 tablespoons ghee and 2 tablespoons vegetable oil over medium low heat, until it sizzles. Add the yogurt and rice mixture to the pot and spread evenly to cover the bottom of the pot. Add the remaining rice to the pot and level off the top and gently pat down with the back of the spoon. Cover the lid with a damkesh or a large kitchen towel. Steam the kateh over medium low heat for 45 minutes to one hour. To serve, remove the lid, place a large serving platter over the pot. Hold the platter and the pot handles and invert the rice onto the platter. 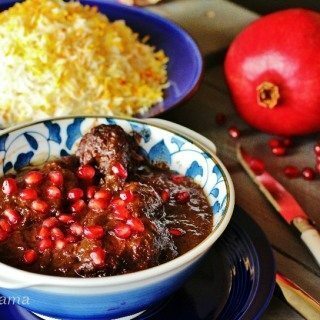 Kateh may be served with a variety of Khoresh (s) that I have posted previously. It may also be served with "omellete," which is a simple fried egg and sliced tomato dish. I usually add a scant amount of sliced fresh hot peppers and fresh herbs (such as scallions, cilantro, basil, tarragon) for added flavor. 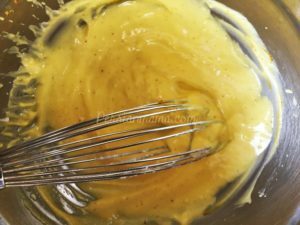 Please see my post for making ghee. To make clarified butter: Bring 1 cup of butter to a low boil in a small saucepan. Turn off the heat and let it rest for 5 minutes. Skim and save the clear butter fat collected on top and discard the cloudy/milky liquid in the bottom of the pan. I had this at a friends house in 3rd grade and I never forgot about it…ive been looking for this for years but had no idea how to describe it and wouldnt even know the name if I heard it. Im SOOOOO excited I found this!!!!!! 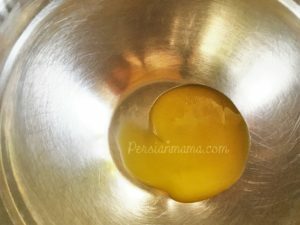 was wondering if i can replace the ghee/butter with oil? I just made this and it was FANTASTIC!!!! I will be making this many more times. 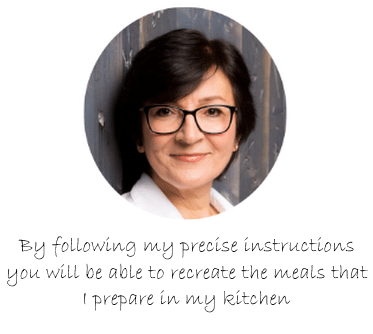 I just discovered your blog and am having a blast reading through it and saving recipes. I have one question about this recipe: We only use whole grain rice, so how much more water should I add to adapt this to our dietary needs (diabetic hubby & I’m a whole grain nut)? Hi Lindsay; I’m so glad that this recipe is working out for you. 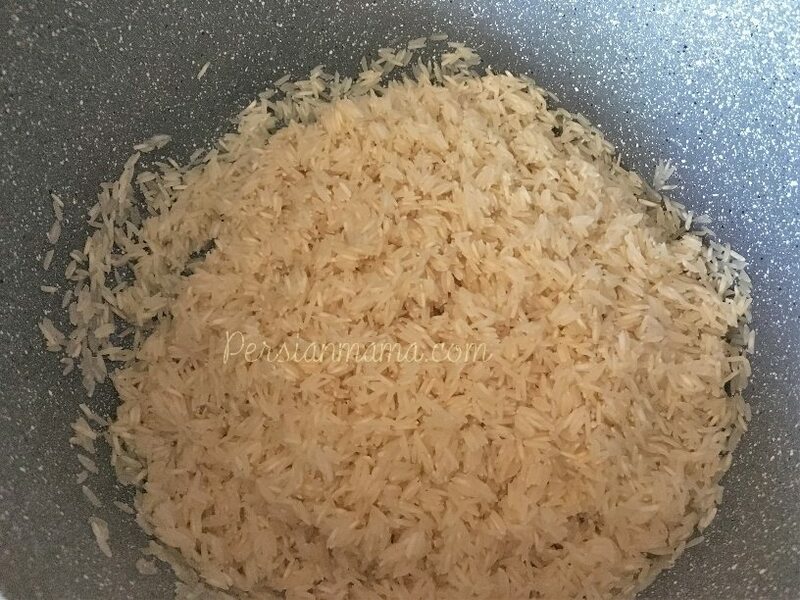 Thanks so much for writing to me and sharing your own version of serving this yummy rice. Please keep in touch and have a great week!